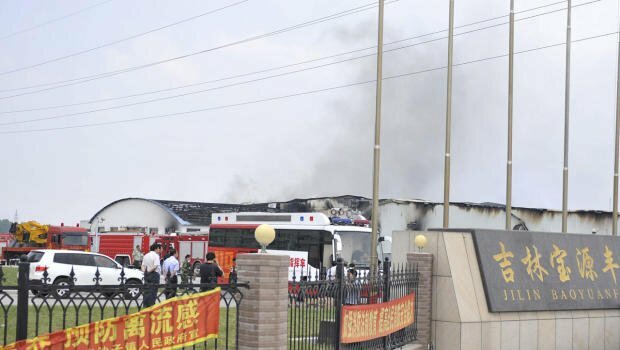 Home Tags Posts tagged with "poultry plant"
At least 112 people have been killed in a fire at a poultry processing plant in China, according to officials. The fire broke out at a slaughterhouse in Dehui in Jilin province early on Monday, according to state-run Xinhua news agency. Rescue workers were at the scene and the fire had not yet been put out, the report said, citing local sources. There are reports that the fire took hold following three explosions in an electrical system. About 100 workers had managed to escape from the plant, Xinhua said, adding that the “complicated interior structure” of the building and narrow exits had made rescue work more difficult. The number of workers trapped inside the plant had yet to be confirmed, the agency added. The cause of the fire was under investigation, it said. Those injured were sent to hospital, Xinhua says. The severity of their injuries however remains unclear. Workers interviewed by state broadcaster CCTV said the fire broke out during a shift change and may have started in a locker room. The company that owns the farm, a big producer of processed chicken, employs more than 1,000 people, reports say. Photographs posted on Chinese news websites showed thick smoke coming from the large cement and corrugated iron sheds, with fire trucks still at the scene. Workplace safety standards can often be poor in China, with fatal accidents regularly reported at large factories and mines. The plant is located around 500 miles north-east of Beijing.